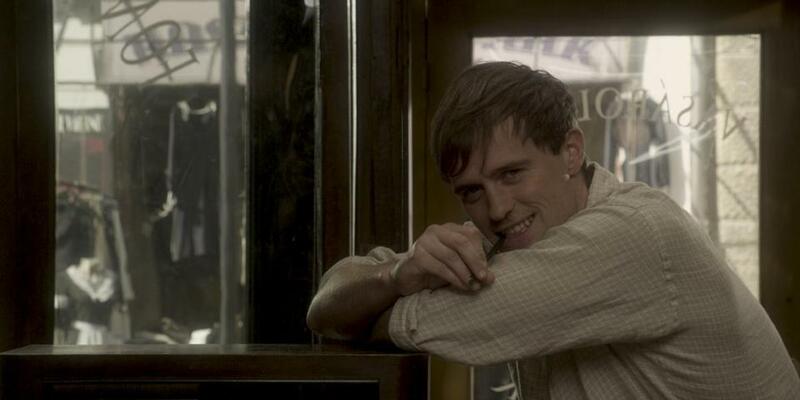 Jonas Armstrong plays a young Jewish man in Hungary who during World War II outwits the Nazis. A bit harsh, perhaps, especially given such subsequent films as “Life Is Beautiful,” that attempt to mitigate the utter evil of the Holocaust through sentimentality. Mark Schmidt’s “Walking With the Enemy” — based on the true story of Pinchas Rosenbaum, who helped save the lives of hundreds of his fellow Hungarian Jews when Adolf Eichmann started deporting them to death camps in 1944 — does not sink to the bathos of Roberto Benigni’s Oscar-winning film, but it does reduce a period of irredeemable horror to the heroics of a single person. In lieu of the real-life Rosenbaum, Schmidt presents Elek Cohen (Jonas Armstrong), first seen swing-dancing in a Budapest club where he meets the lovely Hannah (Hannah Tointon). He also encounters some anti-Semitic bullies, but he and his fellow Jewish students get in their licks in the subsequent fracas before they get tossed into the street. Despite incidents such as this, the treatment of Jews in Hungary up till then had been relatively mild. Under the leadership of Regent Horthy (Ben Kingsley depicts the controversial leader as a Hungarian Gandhi), the country was an ally of the Reich, maintaining tenuous independence and avoiding the worst of the Holocaust. But as the war turns against the Nazis, and Horthy tries to extricate himself from Hitler and seek a separate peace with the Allies, conditions worsen. Bending to Germany’s demands, the Hungarians send Jewish men off to labor camps, including Cohen and his friends. They escape the brutal camps, only to return home to find that their families have been deported. With nothing left to lose, Cohen joins up with a group that provides Jews with Swiss passports. All seems lost when Cohen is forced to kill two SS officers. But he turns this seeming disaster to his advantage. Disguised in a Nazi uniform (he looks like a scrappier version of Tom Cruise in “Valkyrie”), he roams Budapest like a superhero, rescuing Jews from certain death by asserting the arrogant authority of his assumed role. Cohen’s resistance satisfies an audience’s craving for justice and humanity in the midst of unpunished wickedness. In one scene, he and a handful of associates wipe out a unit of the Hungarian Arrow Cross, the pro-Nazi party that took over when Horthy was deposed, as they are about to massacre a group of Jews and dump them in the Danube. It almost makes you forget the thousands of other Jews the Arrow Cross and Nazis murdered with impunity in a similar fashion. “What do you take away from these violent events but still keep it real?” asks Schmidt in the film’s press notes. “I tried to keep it as tasteful as possible.” One can appreciate his desire to be true to his subject and still be entertaining. But Rivette might have argued that when it comes to depictions of the Holocaust, good taste is the most tasteless approach of all.